Looking for a camping mug? 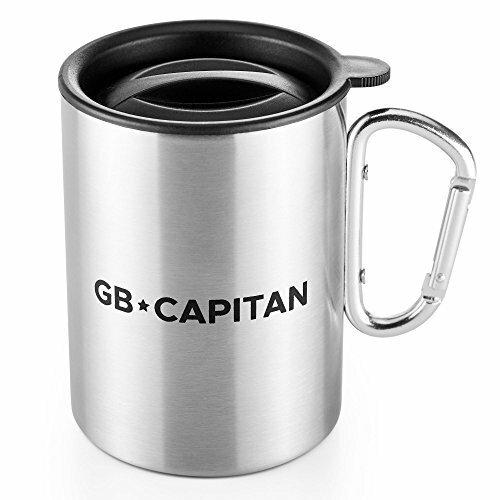 Check out the GB Capitan stainless steel cup for men and women! Pour 16 ozs/480 mls of liquid into it and enjoy your favorite beverage when camping in the wild! The body of the mug is made of stainless steel so it will never get damaged or worn, even with dust, dirt and time. Tired of using plastic and paper cups when outdoors? This stainless steel coffee cup is exactly what you need. You want things to be easy when you are camping, so GB Capitan's stainless steel cup for men and women provides you with great quality, price and volume all at once. Take it with you when camping. You can also use it at home. Everyday use is never a threat to your stainless steel cup! It is easy to wash and use. The stainless steel cup is enhanced with a plastic BPA-free plastic cap, which prevents you from spilling the contents and doesn't smell like cheap plastic. Get your own large stainless steel cup and always have a cup, for yourself or your friends, when you need it. Click add to cart and become a happy owner of this brand-new stainless steel cup for men and women! Stainless steel - This stainless steel cup is made of high-end steel that is completely safe to use and easy to wash and store. There is no chance of this cup breaking. The large volume of this mug is just what you need for camping; you will always have a cup of your favorite beverage at hand. You can also use this stainless steel coffee cup as a bowl when camping since its dimensions are 8*11 cms (3.2*4.5 inches) and it is spacious enough to hold (16 ozs) 480 mls of soup. Sturdy and durable - This steel cup will serve you for a long time, and you won't need any other. The stainless steel coffee cup comes in a nice gift wrap, which makes it a great gift for friends and relatives. BPA-Free plastic cap - A stainless steel lid comes with the cup as a gift. With this specially designed top,you will be able to drink while you are moving, making this stainless steel cup set the most convenient one to use. If you have any questions about this product by GBrothers, contact us by completing and submitting the form below. If you are looking for a specif part number, please include it with your message. Tarskistuff Stainless Steel Cups 4-16oz,Durable,Eco-Friendly,Non-Toxic,BPA Free,Stackable,Great for Kids and Toddlers,for Camping and Picnics.